Edmund Blackstone, Bow Street Runner, of doubtful parentage and background, the best if far from the most conformist in the force, secretly applauds the robbers he hunts. He is tall, well-built, with a strongly featured face and, despite his elegant and expensive attire, moves with ease among the thieves and cut-throats in the taverns and soup shops, the cockfighting pits and dirty alleys of London. But if Blackstone has a weakness for professional esteem and flattery, for a woman's touch and for good wine, he is also one of the best shots in London, an expert in almost all areas of crime, a ruthless man with a reputation for courage and persistence, and - first and last - a Bow Street Runner. "A magnificent novel of suspense and adventure, set in nineteenth century London. At stake - the life of the future Queen Victoria." "The story is steeped in the atmosphere of the period, and as Blackstone moves among the thieves, cut throats and pickpockets in the taverns and soup kitchens of London the tension mounts. The author brings the underworld and its unsavoury characters to life - the story might be fiction but it could just as easily have been history." "The Bond of the Bow Street Runners." "Hot stuff - this Bond from the 19th century." 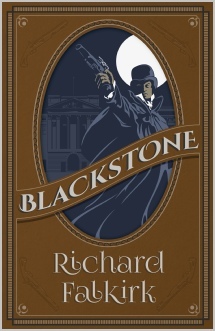 "Blackstone is elegantly dressed, with a weakness for women and good wine - and he is a crack shot. He is also ruthless and courageous, but above all things he is a Bow Street Runner. This tale proved to be a bestseller in America."